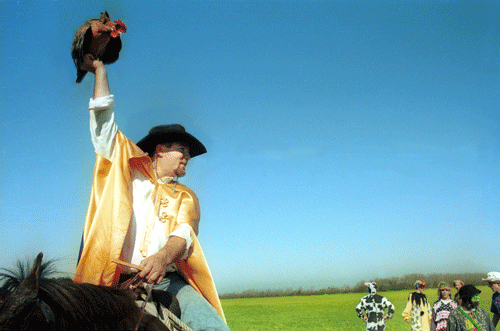 In South Louisiana, the real Mardi Gras action takes place in the countryside. The courir de Mardi Gras celebrations in the countryside of South Louisiana give the popular phrase, “Throw Me Something Mister,” a whole new meaning. Dressed in colorful, homemade costumes with pointed hats and masks, participants in the courir, which means “run” in French, beg for things other than beads or doubloons. What they want are ingredients for a communal gumbo. Costumes conceal participants’ identity and allow them to parody roles in authority – men to dress like women, the rich to pose as the poor. High-pointed hats worn are called capuchons and parody the headdresses of noble ladies. Masks often include animal features like hair, fur or beaks. La capitaines, or captains, serve as leaders, keeping order and getting permission to enter private property. La Chanson de Mardi Gras, the Mardi Gras song, is sung at each home and echoes medieval melodies. Community courirs started off small, with mainly the men riding from house to house. Today, people from all over the world come to watch the spectacle and take part in the Mardi Gras tradition. 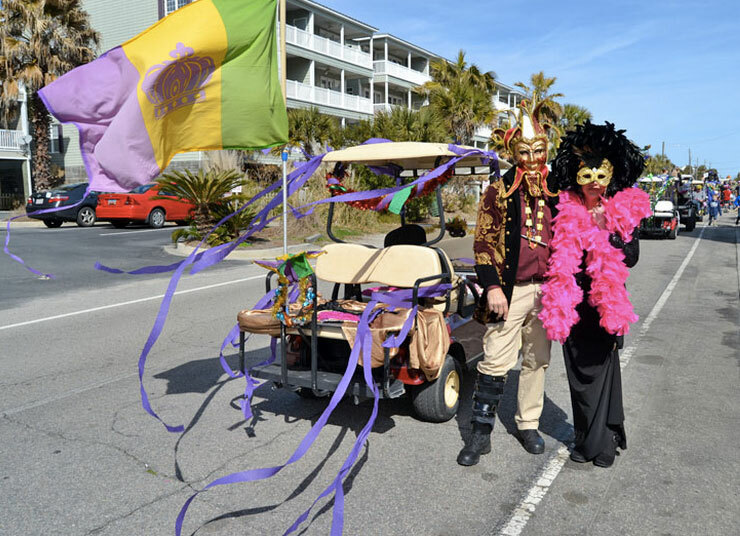 The town of Eunice’s Mardi Gras Association has more than 2,000 participants, male and female, who gather in the town for the run on Mardi Gras day. Activities in downtown Eunice also take place while the courir is winding through the countryside. 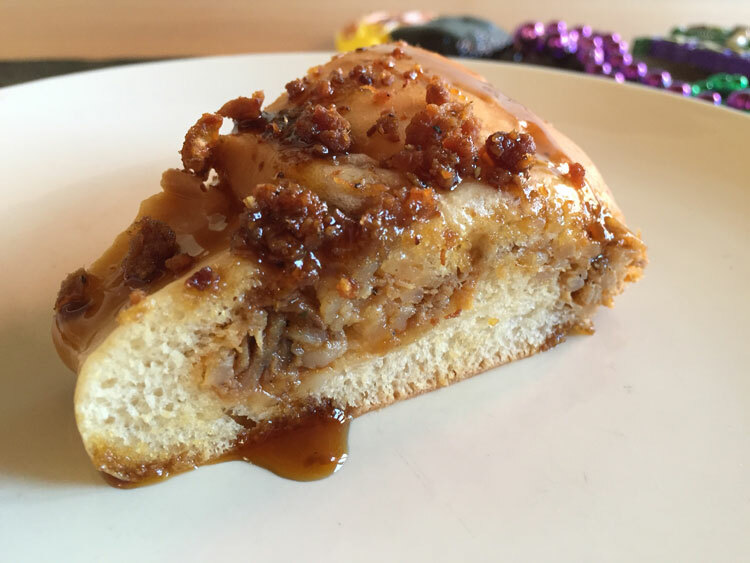 Music, dancing, traditional Cajun foods and the world’s largest king cake entertain tourists and locals until the courir arrives for a parade that afternoon. The hard-earned gumbo is also prepared that evening. The town of Iota, or Tee-Mamou as it’s called around the area, is the site of the Mardi Gras Folklife Festival and the Tee-Mamou Courir. Meaning “little Mamou,” Iota is located 25 miles southwest of Mamou, also known as Grand Mamou or Big Mamou. Their courir travels in a converted cattle trailer and makes its way into town for the festival. Instead of tossing favors in the festival’s parade, the runners beg for donations. Grand Mamou attracts thousands of visitors, and a street dance is held Monday night, with the courir on Tuesday. The all-male courir remains faithful to traditions, and the capitaine and co-capitaine in colorful capes are the only riders not masked. On horseback and in flatbed trailers, participants and musicians stop at homes in rural Evangeline Parish, singing, dancing and begging for chickens. A highlight of the run is when a homeowner throws a chicken out to the riders, who then chase and try to capture it for the gumbo. Rural runs are as much a part of South Louisiana Mardi Gras as king cake and beads. While larger cities like Lafayette, Baton Rouge, and of course New Orleans, celebrate their Mardi Gras with balls and parades, the countryside is where the real action takes place. You haven’t experienced Mardi Gras until you see grown men chasing a chicken through a field and taste some of that communal gumbo. Mamou Mardi Gras photos by Terri Fensel. Simple magic in not simple festival. Mardi Gras is about music, parades, picnics, floats and excitement. It’s one big holiday in New Orleans! Mardi Gras is the biggest celebration the city of New Orleans hosts every year. This magnificent, costumed, beaded and feathered party is laced with tradition and is all about having a good time!